Passersby are silhouetted as a huge street monitor broadcasts news reporting ousted Nissan Motor chairman Carlos Ghosn's indictment and re-arrest in Tokyo, Japan Dec. 10, 2018. Nissan Chief Executive Hirota Saikawa said on Jan. 21 he had not heard directly about a French proposal to integrate the Japanese carmaker's management with Renault. The Nikkei newspaper reported on Jan. 20 that a French government delegation had informed Tokyo it would seek an integration of Renault and Nissan, most likely under the umbrella of a single holding company. Asked about future capital ties, he said: "We are not at the stage for such discussions." 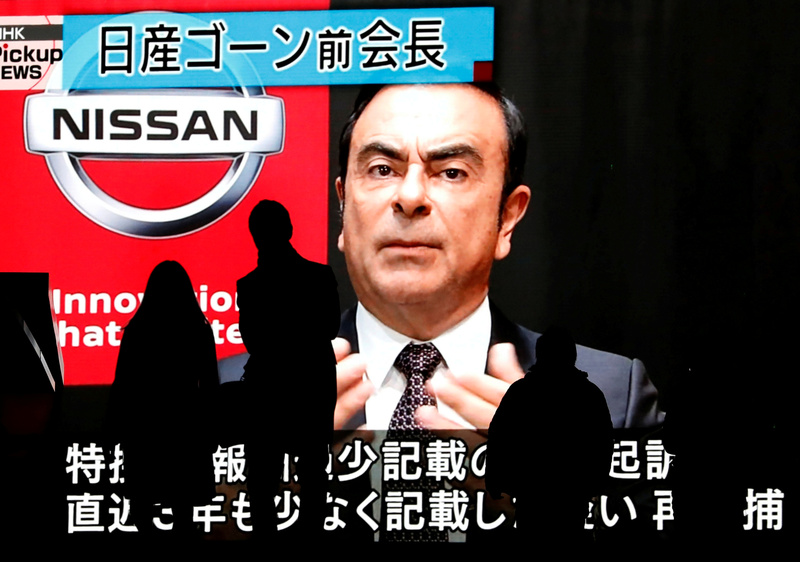 Ghosn, under pressure from the French government, had pushed for a deeper tie-up between the two carmakers, including possibly a full merger, despite strong reservations at Nissan. Renault shares were up 0.5 percent to 57.36 euros at 0900 GMT on Jan. 21 . Nissan’s Tokyo-listed shares closed 0.4 percent higher.